MoreSteam is the leading global provider of online training, certification, and technology for Lean Six Sigma. Industry associations, leading universities, and partners trust MoreSteam. Access newsletters, press releases, webcasts, and product updates. Meet the people behind the software who are dedicated to helping you solve business problems. Develop the skills to lead successful continuous improvement projects. Includes exercises, quizzes, and mini simulations. Combine eLearning with study halls, personal coaching, and practice. Covers advanced quantitative tools. MoreSteam partners with the Fisher College of Business at The Ohio State University to present an innovative Master Black Belt development program. With over 200 hours of training to choose from, browse through the entire belt curriculum to find the courses you need. Our most popular training simulation, a hands-on, one-day simulation that illustrates Lean Office principles and best practices. Run a successful DMAIC project in this 2-3 day team-based, simulated project game for Green and Black Belts. A team-based, one-day simulated project game for practicing the investigative and analytical skills Lean Six Sigma professionals need. A flexible process improvement case study with data sets and tools for instructors to deliver multiple learning objectives. A 2-4 hour DMAIC tollgate simulation designed for Lean Six Sigma team Sponsors and Champions. Analyze your data with EngineRoom - the online application that combines statistics with problem-solving tools. Manage your projects, track your team's progress, and share critical project information with TRACtion®. Use Process Playground™, a process mapping and simulation application, for agile process design and DFSS. Engage trainees in effective, practice-based training with realistic simulations and games. Combining eLearning with classroom exercises, coaching, and project-based applications to execute a high-quality, low-cost training program. Benefits, common components, and timelines for blended learning deployments. A handbook for those interested in Blended Learning to understand how to design and initiate a robust training program. Deepen your understanding about Blended Learning with our library of articles, presentations, and links to outside reference materials. Gain insights and tips from organizations across a variety of industries that have implemented a Blended Learning model. 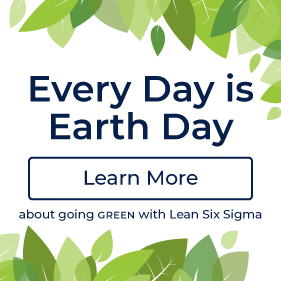 Browse the full collection of free resources on Lean Six Sigma and process improvement, including tutorials, webcasts, and white papers. Learn about commonly used tools for measuring process performance, root cause analysis, process control, and more. Watch recorded presentations hosted by industry-experts and quality practitioners. Read the MoreSteam blog for articles on a wide-range of interesting topics and tools. If measurements are used to guide decisions, then it follows logically that the more error there is in the measurements, the more error there will be in the decisions based on those measurements. The purpose of Measurement System Analysis is to qualify a measurement system for use by quantifying its accuracy, precision, and stability. A manufacturer of building products was struggling to improve process yields, which had a significant impact on product cost. Experience indicated that there were several process and environmental characteristics that influenced the process yield. Data were collected on each of the variables believed to be significant, followed by regression and correlation analysis to quantify the relationships in statistical terms. The results showed no clear correlation between anything - in spite of years of anecdotal evidence to the contrary! In fact, the underlying strong correlation between variables was confounded by excessive error in the measurement system. When the measurement systems were analyzed, many were found to exhibit error variation 2-3 times wider than the actual process spread. Measurements that were being used to control processes were often leading to adjustments that actually increased variation! People were doing their best, making things worse. As you can see from this example, Measurement System Analysis is a critical first step that should precede any data-based decision making, including Statistical Process Control, Correlation and Regression Analysis, and Design of Experiments. The following discussion provides a broad overview of Measurement System Analysis, along with a spreadsheet analytical tool that can be downloaded (Gage R&R Worksheet) . Stability refers to the capacity of a measurement system to produce the same values over time when measuring the same sample. As with statistical process control charts, stability means the absence of "Special Cause Variation", leaving only "Common Cause Variation" (random variation). Bias, also referred to as Accuracy, is a measure of the distance between the average value of the measurements and the "True" or "Actual" value of the sample or part. See the illustration below for further explanation. Linearity is a measure of the consistency of Bias over the range of the measurement device. For example, if a bathroom scale is under by 1.0 pound when measuring a 150 pound person, but is off by 5.0 pounds when measuring a 200 pound person, the scale Bias is non-linear in the sense that the degree of Bias changes over the range of use. Repeatability assesses whether the same appraiser can measure the same part/sample multiple times with the same measurement device and get the same value. Reproducibility assesses whether different appraisers can measure the same part/sample with the same measurement device and get the same value. Efforts to improve measurement system quality are aimed at improving both accuracy and precision. Variability small compared to the process variability. Variability small compared to the specification limits (tolerance). The resolution, or discrimination of the measurement device must be small relative to the smaller of either the specification tolerance or the process spread (variation). As a rule of thumb, the measurement system should have resolution of at least 1/10th the smaller of either the specification tolerance or the process spread. If the resolution is not fine enough, process variability will not be recognized by the measurement system, thus blunting its effectiveness. Determine the number of appraisers, number of sample parts, and the number of repeat readings. Larger numbers of parts and repeat readings give results with a higher confidence level, but the numbers should be balanced against the time, cost, and disruption involved. Use appraisers who normally perform the measurement and who are familiar with the equipment and procedures. Make sure there is a set, documented measurement procedure that is followed by all appraisers. Select the sample parts to represent the entire process spread. This is a critical point. If the process spread is not fully represented, the degree of measurement error may be overstated. If applicable, mark the exact measurement location on each part to minimize the impact of within-part variation (e.g. out-of-round). Ensure that the measurement device has adequate discrimination/resolution, as discussed in the Requirements section. Parts should be numbered, and the measurements should be taken in random order so that the appraisers do not know the number assigned to each part or any previous measurement value for that part. A third party should record the measurements, the appraiser, the trial number, and the number for each part on a table. Select a part from the middle of the process spread and determine its reference value relative to a traceable standard. If a traceable standard is not available, measure the part ten times in a controlled environment and average the values to determine the Reference Value. This part/sample will be designated as the Master Sample . Over at least twenty periods (days/weeks), measure the master sample 3 to 5 times. Keep the number of repeats fixed. Take readings throughout the period to capture the natural environmental variation. Plot the data on an x̄ & R chart - consult the Statistical Process Control section of the Toolbox and calculate control limits. Evaluate the control chart for statistical control. Again, consult the Statistical Process Control section of the Toolbox for assistance with this assessment. Instability in the measurement. If the SPC chart shows a trend, the measurement device could be wearing or calibration could be drifting. Determine the number of appraisers, trials, and parts, which may vary from study to study. A rule of thumb is 2-3 appraisers, 2-3 trials, and 5-10 parts - with 10 being greatly preferred. The downloadable MoreSteam.com spreadsheet will accommodate any combination within this range. In this example we will use 2 appraisers, 3 trials, and 10 parts. Identify three appraisers who are all trained in the proper measurement procedure and identify them as A, B & C.
Fill in the yellow blanks at the top of the form with the required background information (Gage Type, Date, etc.). Also fill in the blank at the bottom of the form asking for the total specification tolerance. Collect ten parts that represents the range of process variation. If the parts don't vary as much as the process, the gage error will be overstated. Identify each part with a number 1-10 in such a way that the appraisers can not see the numbers as they take the measurements. Please refer to the data collection chart below. You will see that appraiser A's three trials are recorded in rows A-1, A-2, and A-3. Likewise, Appraiser B has rows B-1, B-2, and B-3, and Appraiser C has rows C-1, C-2, and C-3. Start with Appraiser A and measure each of the ten parts in random order. A third party should record the results of the first trial in row A-1. Proceed to Appraisers B & C following the same process. Then repeat the process for trials two and three. Variation from the measurement device, or Repeatability, equals 25.98% of the total part variation, and 28% of the specification tolerance. Variation from the appraisers, or Reproducibility, is equal to 6.02% of the total part variation, and 7% of the specification tolerance. Total variation from Repeatability and Reproducibility combined (they are not directly additive) is 26.67% of the total variation, and 29% of the specification tolerance. The rule of thumb for acceptance of a measurement system is a total Gage R&R of 30% or less of the lessor of Total Variation or the Specification Tolerance. In this case, the measurement system is capable, and can be used as a basis of decision making. If the measurement system has error in excess of 30%, the first step to improve results is to analyze the breakdown of the error source. If the largest contributor to error is Repeatability, then the equipment must be improved. Likewise, if Reproducibility is the largest source of error, appraiser training and adherence to procedures can yield improvement. You can download a functional version of the Gage R&R spreadsheet. MoreSteam Hint: If the measurement system is not capable (error above 30%), error can be normalized by taking multiple measurements and averaging the results. This can be time consuming and expensive, but it can be used to provide reliable measurement data while the measurement system process is being improved. There are other methods that can be used to evaluate measurement systems. Most statistical software packages, including Minitab, support ANOVA methods. You can download free trial versions of several software packages through the Toolbox. Measurement Systems Analysis is a key step to any process improvement effort. By understanding existing measurement systems a team can better understand the data provided by those systems and make better business decisions. Need a tool for MSA? Download a 30-day trial version of EngineRoom, MoreSteam's convenient, new Web-based statistical tool, and start today. MoreSteam.com offers a wide range of Lean Six Sigma online courses, including Black Belt, Green Belt, and DFSS training. Flexible training at an affordable price. Our monthly email delivers the latest ideas and resources. See what else is available in our free Toolbox. Visit our resources section more free materials.